Rotating power generation equipment forged shaft steels are designed to provide reliable operation due to thermal, mechanical, and environmental wear. In some cases, forged shaft steels can be damaged due to this normal wear, causing corrosion pitting, scoring, hardening, low cycle fatigue cracking, high cycle fatigue cracking, stress corrosion cracking, and/or creep cracking. Procurement of a new rotor shaft forging is a very costly and lengthy process that can take up to 24 months. Alternatively, weld repair or restoration can be accomplished for a fraction of the cost and in less time. MD&A focuses on offering both in-kind, as well as upgraded weld filler materials that address many of the most common operational and stress related failures. MD&A is capable of providing full turnkey weld repair and reconditioning services to include equipment inspections and damage assessment, weld repair solution definition and recommendations, baseline and weld repair geometry finite element analysis, as well as root cause failure analysis. Phase I - Weld overlays of journals, oil seal areas, dummy areas, and shaft end / interstage gland areas. Phase II - Weld buildups of couplings, thrust collars, wheels, and dovetails / blade attachment areas. 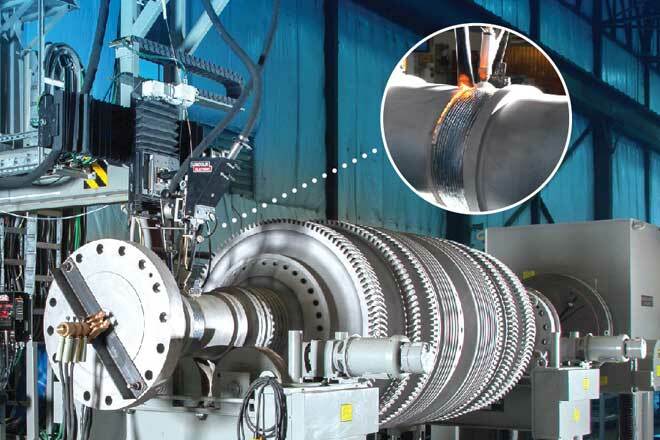 Centrally located in St. Louis, the MD&A Turbine-Generator Repair Facility has successfully completed many shaft weld repairs of steam turbines, gas turbines, and generator rotating fields. • The welding station is capable of performing weld repairs / restorations of steam turbine, gas turbine, and generator rotating fields up to 45' in length, 12' in diameter, and 100 tons in weight. • Koike-Aronson Rotor Welding Station with Lincoln 1000 amp AC/DC SAW (Sub Arc Welding) Head and Arc Machine 400 amp GTAW (Gas Tungsten Arc Welding) Head. • The welding station has a foot print of 50' long and 20' wide with a Scarab II weld manipulator that has a 14' tall mast and a 7' boom reach.